The Minocqua area is home to many great annual events, such as Beef-a-Rama™ and No Frills Marathon™ & Half-Marathon in September, Christmas in Minocqua in November, Only Fools Run at Midnight in April, and seasonal arts & crafts shows. Whenever you visit, you’re sure to find plenty to do. From local theater productions and craft fairs to foodie festivals and athletic events, there’s always something happening in the Northwoods. Visit our Events Calendar page for event information and a complete list of area happenings. Fools from near and far will romp through the streets and trails of Minocqua starting at 10:00pm for the Annual Only Fools Run at Midnight Run/Walk. Don&apos;t be a fool...be sure to finish before the clock strikes midnight! New this year - Visit the Virtual Home Show from April 1-20, 2019. The Minocqua Home, Lifestyle and Sport Show is organized by the Minocqua Area Chamber of Commerce. This one day event will inspire homeowners, outdoor enthusiasts, those interested in health and lifestyle issues along with folks looking for something new to do in the area. More than 50 exhibitors at June Bloom will display and sell a wide variety of unique handcrafted items. The artisans and craftsmen featured at the show are selected for their handmade craftsmanship and artistic talents. Paws in The Park is bringing tons of four-legged fun for the whole family to Torpy Park in Minocqua. The event will feature dog agility demonstrations, a pet expo, and Dock Dogs of Wisconsin. 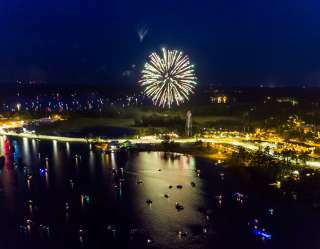 Celebrate Independence Day by joining the fun on July 4, 2019 in downtown Minocqua. The chairs start lining the shady side of Oneida Street at 6 am in anticipation of the afternoon parade. Save your seat and spend the rest of the morning and early afternoon shopping & visiting our downtown stores & restaurants. More than 100 exhibitors set up rain or shine and sell a wide variety of unique handcrafted items. The Bearskin Trail is what makes this Marathon unique among races. The trail is a hard-packed crushed granite surface that crosses 9 railroad bridges, and no sidewalks filled with spectators. In fact, you will not see a single sidewalk along the entire route! What you will see is some of the most beautiful forests and scenery that Wisconsin’s Northwoods has to offer; streams, lakes, balsam swamps, hardwood forests, open meadows, old railroad bridges, and a variety of wildlife. The Minocqua No Frills Marathon is a point-to-point course. The first 6 miles are on paved town roads. The remaining 20 miles follows the entire length of the Bearskin Trail. Hailed as the Northwoods mardi-gras, Beef-A-Rama™ has something for everyone at this end-of-summer extravaganza! Live music at Torpy Park on Friday evening kicks off the festival. Saturday has a line-up celebrating everything beef. The downtown Beef Cook-offs begin bright and early Saturday morning along with live music & other tasty treats. Roast beef sandwich sales start at 10:00am Other activities include the 10K and 5K Rump Roast Run and Walk along Lake Minocqua at 9:00am, Prime Choice Craft Show at Torpy Park, Beef Eating Contest at 11:30am, live music at two stages, Cow Pie Plop, Petting Zoo & Bouncy Houses for the kids, and of course the famous Roaster Stampede at 2:15pm down main street! The Prime Choice Craft Show is a part of Minocqua&apos;s Annual Beef-A-Rama celebration which brings over 10,000 people into town for the day. Close to 75 exhibitors set up rain or shine and sell a wide variety of unique handcrafted items. The artisans and craftsmen featured at the show are selected for their handmade craftsmanship and artistic talents. You will see original artwork, pottery, jewelry, tapestries, clothing, photography, wood creations and more. Live music and food concessions on the upper level of Torpy Park and throughout downtown Minocqua make this the place to be on the last weekend of September.